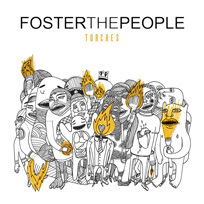 I feel like I've been listening to Pumped Up Kicks by Foster the People for years. I don't recall where, when or how I first heard it. It wasn't on the local radio station (it seems like the indie one in my area is just now picking up on it). But regardless, Foster The People is a band that everyone is buzzing about. Their debut album, Torches, is a nice first effort. Like the rest of the cult, I love Pumped Up Kicks. But other tracks that I enjoyed on this album include Helena Beat, Houdini, and Miss You. The album will be a nice listen for the summer but it's a bit repetitive. It feels familiar in an excellent way at times but also in a cliche form at others. It's love it or leave it. I'm curious to see Foster the People live when they roll through Pittsburgh on August 8th.